For the first time ever, Moonstone has made several issues of the Vampire: the Masquerade comic book available in digital format! Vampire the Masquerade: Beckett – We travel back and forth in time with Beckett, as he hunts between the lines for a lost treasure. 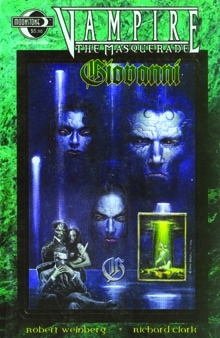 Vampire the Masquerade: Giovanni – At the behest of Clan Patriarch Pietro Giovanni, Isabel and MADELEINE GIOVANNI are sent to New York to attain an infamous painting. Vampire the Masquerade: Theo Bell – Theo squishes some windpipes as he finds himself embroiled in a power struggle, with more than one high ranking Vampire hiding an explosive secret. Each of these comics is only $1.99 in digital format! Get them all today! Check out all of the Moonstone Books available now at DriveThruComics.com! ← New titles in Print at DriveThruRPG!